Do you have “Text Messaging” on your cell phone? FBC is now offering Text Alerts to get information out about specific events, i.e. Bad Weather Alerts, Cancellations / or Time Changes, etc. You will receive a text response with additional instructions. You need to Reply “YES” to enroll. 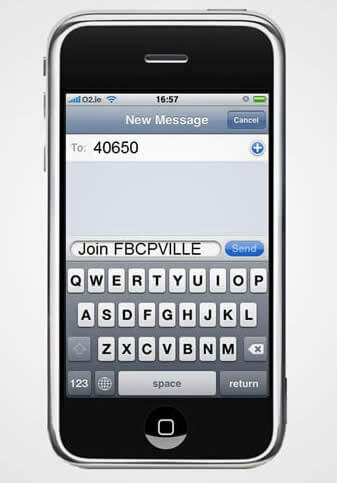 You will receive a second message welcoming you to FBCPville Info Alerts. You will then receive an additional message (from #1(210) 100-005) asking for your First Name, and then another for your Last Name. These steps are optional and you can reply #SKIP if you don’t wish to give your name. Contact the church office, 512-251-3052 if you have any questions.